Patriot Group Ltd is a British based security organisation specialising not only in personal protection but also the security of companies and international corporations around the world. Our client base covers the whole spectrum of business, industry and governments at home and abroad. The Group is made up of four divisions, with expertise drawn from both the Military and Commercial sector, headed up by our highly experienced team leaders. Each team is drawn from differing professional backgrounds and disciplines, including SAS, SBS, SSR, SFSG, Parachute Regiment, Royal Marine Commandos and the British Police Force. All PolArm instructors are National Police Improvement Agency (NPIA) trained and accredited. Being in constant operational duty around the world our teams provide the most comprehensive and up to date operational methods used within today’s diverse security environments. Patriot staff have collectively served in every major British conflict around the world, most recently operating in Iraq and Afghanistan. 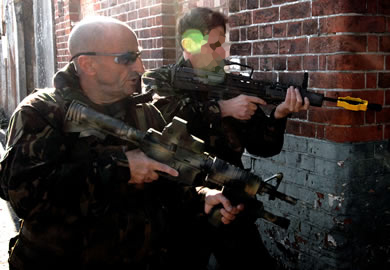 Over the last 10 years training team members have been operating and providing instruction to the Police and Special Forces in Russia, the Middle and Far East, having also fulfilled a Foreign Office contract for Close Protection and Hostage Rescue for the Commonwealth Games in Malaysia.